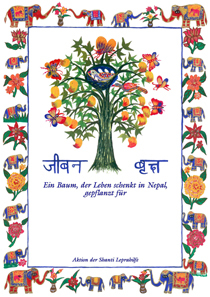 Donations - Shanti Leprahilfe Dortmund e.V. In order too keep all of the projects running, Shanti needs much money, each day, each month, each year – a never-ending task! Please help us reach this consistent level of donations to ensure that the services provided are not interrupted! There are many ways you can support the work of Shanti Leprahilfe – and we are very grateful for every donation, whether large or small. Whether you'd like to collect money for us at your birthday or anniversary, consider us in your estate planning, or for regular or spontaneous donations – it's all welcome! You also have the option of using our donation form. Please send the fulfilled form directly to our office in Dortmund. We are recognised by the responsible finance office as an especially eligible for funding due to charitable purposes. This allows us to issue donation receipts. We will send these to you during the first half of January the following year; no action is required on your part. If you would like to receive your donation receipt earlier, then please contact us. Important: we can issue donation receipts only if we have your complete address. All donors will be included in the distribution list for the Shanti newsletters, which is why we need your complete address. This girl is very concentrated on her school exercises. These new caps – a donation from Switzerland – protect disabled children from the sun outside. The Shanti centre in Tilganga features a computer room with donated laptops for older youth. The roots of fruit trees secure the soil on the steep grounds of Budhanilkhanta. You could also sponsor a child who has found refuge here at Shanti. With at least € 30 per month, we can cover the basic costs of food and clothing for the child. However, additional funds are needed to pay for kindergarten or school as well as medical care. The money you donate will not be used exclusively for “your” specific child, but goes into the so-called “children's donation fund”. This fund is used to cover the expenses for all of the children cared for at Shanti. We do this because many of the children in the Shanti family do not yet have sponsors. We want to avoid giving these children the feeling that they are not loved. Naturally, all of the children – whether sponsored or not – go to kindergarten or school and receive the same amount of food and medical attention, of course. Through sponsorships, we can be sure to cover the total monthly expenses for all children. Yes, I would like to sponsor a child! Our Life Tree Project is something special. On one hand, the steep grounds in Budhanilkhanta is held firmly in place by the roots of the fruit trees, while on the other hand these trees provide the Shanti residents and children with fresh fruit and necessary vitamins. Trees like these are a wonderful gift for birthdays, anniversaries, weddings, achievements and other occasions. You might also let a living tree grow in memory of loved ones who've passed on. Tree donations are easy to make via the form. You can choose whether to donate one or multiple trees or donate above the € 20 per tree. We will thank you with a stone engraved with your name, which will be added to the large stone pyramid of all donors in Budhanilkhanta. We will also send you a decorative certificate designed by one of the Shanti painters. Yes, I would like to donate a tree!